"About this time an independent man – not of very good reputation – wanted me to make a film and I said 'No, I don't want to make films anymore.' And he came and came and came, and finally I said 'Look, I will make a film, but you will have nothing to say for it. You don't know what it will be, you have no right to cut it, you only can give the money.' He said 'Fine, understood.' And so I made M."
That's how it should be and hardly ever is; the artist unfettered by the illusion we all subscribe to, the assumed value and power of coin. In film-making, money has always falsely bought the right to meddle after the event and I admire the cojones on Lang for basically saying "this is how it's going to be..." But then someone (full of religious conviction) paid Michelangelo to paint the Sistine Chapel. It's also a sweet story given extra value by way of the dubious standing of his fiscal benefactor. Box Office Mojo was not online in 1931 but I'd like to think M was a smash hit. As a director, Lang had come to a comparable fork (granted with a single prong and another soon to be an extinct one) in the film production road that we find ourselves at today, over eighty years on. M was Lang's first sound movie and the craft in which he had been excelling was about to hit a brick wall with a resounding hissing crash (alas, Dolby was still forty four years away). The coming of sound utterly demolished silent film just as the latter was beginning, creatively, to fly. I'm pretty sure that 3D will not vanquish 2D as comprehensively. Did Lang allow the new technology to cramp his style? It's almost as if the added inconvenience spurred him on to cinematic greatness. In a German city in the 30s, (Berlin, though I can't be certain as German is not my second language) children are being lured by their sweet-tooths, socially mollycoddled by a seemingly avuncular figure and then systematically brutally murdered by way of the cover of nearby bushes. Fear is rampant and both police and underworld are in turmoil. The authorities have no leads (it's hard to glean clues from a murderer who acts on impulse; CSI Berlin would not have helped in this case). The criminal contingent's usual shady businesses have been adversely affected. So the manhunt is on. 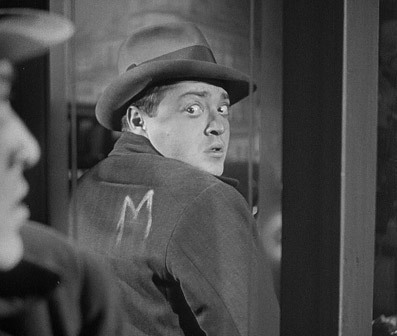 M is full of signature Lang techniques, some camera moves that for all the world seemed technically impossible at the time (was Orson Welles influenced by Lang? It would seem so). 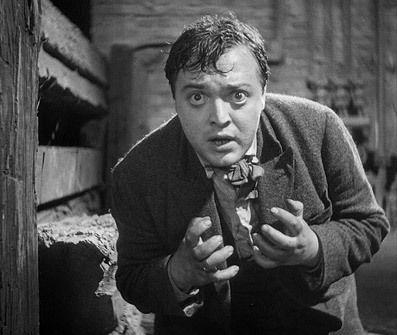 There're a few editing touches that are still vibrant and used today (one gorgeous cut in particular brought Nic Roeg and his transitional editing style to mind melding authorities and anti-authorities as one) and the performance from Peter Lorre is simultaneously theatrical and achingly real. But what stays with you is the overall weight of the piece, its power seemingly undiminished over all this time. Yes, there are aspects that anchor the film in the shifting fortunes of a country clawing back its self respect in the worst way possible – the ascension of a certain Herr Hitler – but the movie stands up today as the stylish, stark and Grand Guignol great grandfather of the psycho-killer genre. Yes, it is a sound movie (in more ways than one) but Lang has brought a silent film-maker's sensibilities to the (editing) table. He knows the power of silence. Watching the film again recently, I was struck by how many times it lapsed into silence in order to intensify the next sound that you hear. Its opening sequence is a belter and one in which Lang's credentials are shown up front, waved into a metaphorical border guard's trained eye. Here is a master storyteller so much so in his fluid element, he must have had developed mutated Teutonic gills with which to breathe. The only mainstream film-maker who comes close to aping the techniques redolent in this era was then neophyte Alfred Hitchcock. It's no coincidence that Hitchcock revered German expressionism and folded it into his stylistic palette. Back to the opening scene. Children are being picked up by anxious mothers as a poster informs us that there is a child murderer on the loose. Frau Beckman is waiting for her child, Elsie whom we've seen being bought sweets by an as yet unidentified man. Children return home to Frau Beckman's apartment block but there's no sign of Elsie. The effect is heightened by the love and care taken over the preparation of the child's meal. The audience know that Elsie will not taste the soup being lovingly made for her and we can also forecast the pain her mother will soon be experiencing. Every maternal display of love drives the blade of despair even deeper. Dramatic irony doesn't get more poignant. There follows a montage that expertly underlines the loss of a child (did this and in particular the ball as a symbol of childhood innocence influence Bob Fosse in staging the abortion scene in Cabaret?) But we do not wallow in the mother's grief. Lang's done enough here. In fact, the movie then changes tack and becomes a prototype procedural film in which the actions of the police are mirrored by the underworld. Another aspect of the film that strikes a modern viewer squarely in the 'awed' camp is its reliance on a starkly but necessary intelligent reading of its own technique. I was compelled to note that a shorter (some may say butchered) version of M exists (for American consumption I believe). One of the 'superfluous' scenes excised is one of M's coups de grace. A child is targeted, stalked and just before the metaphorical kill – the offer of some desultory confectionery – the girl's mother arrives to whisk her daughter from the maws of death. Lang has his child killer take to a café and order cognac. Two cognacs. There is no other scene in the film that so beautifully (can that be the right adjective?) displays the inner workings of the murderous mind that knows it's wrong, abnormal, desperate. Lang has Lorre perform behind a trellis and as a viewer we are aching for a solid mid-shot or close up but Lang leaves us 'outside' his killer's mind (where we should be) looking in. It is intellectual film-making at its most sublime. It's usually a curse word (intellectual) but the readings on offer in this scene alone mount up until you are overwhelmed by the subtext that Lang is able to bury in this one scene. Needless to say, Lorre is superb here registering self-disgust at the vicarious use of alcohol as a substitute for the effects of murder and its attendant relief from the demons that plague him. Here are the seeds planted for his albeit reluctant absolution. If there is ever a motivation for alcoholism, here it sits. Lang also manages a deus ex machina that appears to be an embedded clue that we seem foolish not to have picked up on. In full stalk mode, Lorre makes the very obvious mistake of whistling Grieg's In The Hall Of The Mountain King over and over (apparently Lorre couldn't whistle and it's Lang's own tuneful performance which is heard in the film). A blind balloon seller puts two and two together and comes up with a number way beyond four. The 'whistler' could not have been the only man near by as the girl was abducted but it's Lang's confidence in his sleight of hand storytelling that barrels you past this small misstep. The fact that it is Lorre identified as the killer is seen as a self-evident result of the blind man's certainty when he (and we) could not be certain at all. No matter. Lorre is now a hunted man and the film manages (how, I cannot say) to transfer a smidgeon of sympathy to this awful, driven monster. The trap is set and Lorre is cornered after a great effort by the criminal fraternity. Some even are sacrificed to quell the unacceptable demon in their midst. But Lorre is not en route to conventional justice (although he pleads that this must be so). He is driven forward in front of the 30's version of a kangaroo court, a drumhead of sorts, a place where emotional justice is to be meted out. Hundreds line a makeshift underground courtroom presided over by another murderer who seems to have gained some Teflon like immunity from prosecution simply by dint of his crimes not being committed against children. Where I can acknowledge that a young life taken is seen to be more heinous a crime than an adult life taken in the pursuit of wealth, it still seems a pretty dodgy reason to me. Is not a life, a life regardless of that life's time spent on the planet, worth equal consideration? That's not a popular conception (and as a father I can fully accept the common view of the matter). But Lorre and his defence counsel (a brilliant and careful performance by Rudolf Blümner) make valid points. Like the Dark Knight's Joker, here are amoral monsters making a damnably valid case. This isn't to suggest that if someone promised harm to my offspring, I wouldn't act in an irrationally violent way. Wouldn't we all? M is film-making at its finest; morally questioning, offering no easy solution to the fate of those driven by urges they are unable to quell. So what do we do? It's M's greatest coup, that we never find out what actual justice is meted out to Lorre's child killer. He lives. He dies. No matter to those ripped apart by grief despite the emotional urge for ultimate justice. "If my doctor told me I had only six minutes to live, I wouldn't brood. I'd type a little faster." M shows us what's possible in film terms. Let's all type a little faster. My relationship with the digital incarnation of M goes back seven years to 2003 when Eureka's 2-disc release of the restored print of the film set the bar for how good older films could look on DVD. The running time of the print on that disc was 108 minutes 24 seconds, while the DVD version of this new release is 109 minutes 30 seconds (excluding the textual introduction), which I'm assuming is accounted for by the restoration of shots that were still missing from that version. The 2000/01 restoration from which this release was taken was carried out by the Netherlands Filmmuseum in collaboration with the Bundesarchiv-Filmarchiv, the Cinémathéque Suisse, KirchMedia and ZDF/ARTE, with funding from the Mondriaan Stichting. The original negative of a 96 minute version preserved by the Bundesarchiv-Filmarchiv was used as the primary source and wherever possible missing scenes were sourced from prints from the same period from the Cinémathéque Suisse and the Netherlands Filmmuseum. Comparing the transfer side-by-side with the 2003 release, the differences aren't as drastic as you might expect, largely because of the quality of the 2003 transfer. However, there are areas in which the new transfer is visibly superior, in a subtler and more consistent contrast range that reveals more detail in shadow areas without letting the black levels slip into grey and detail that is a shade crisper, something visible on fine detail of clothing, small objects and textured surfaces (the tracking shot over the table of articles recovered by the police is a good example). On the Blu-ray version this is even more pronounced. The print is largely stable (some very slight frame movement is still present) and remarkably clean – dust is still visible, but most of the time you'll hardly notice it. The windowboxing of the earlier release has also been abandoned and the picture is thus larger in frame. The included grabs are all downsized from the Blu-ray release. The mono soundtrack has also been restored and despite the narrow dynamic range is always clear and free of damage. The inevitable background hiss has been pushed right back and is hardly noticeable during the quieter scenes. Commentary 2 contributor Torsten Kaiser claims he can hear things on this restoration that he's never heard before, and I'm not about to argue. The uncompressed DTS-HD Master Audio mono track on the Blu-ray definitely has the edge on its DVD counterpart. The subtitles have also been updated from the previous version – the children's song at the start now warns of a man in black who will make mincemeat out of you with "his cleaver blade so true," rather than the bogeyman who will cut small pieces out of you with his chopping knife. Not being a German speaker I can't say which is the more accurate of the two. One small thing about the Blu-ray menu – you can't access the Fritz Lang interview or the English language version of the film (and vice versa) from the pop-up menu during the film itself, and the only way I could get back to the main menu from here was to select the last chapter of the film and fast forward. I have no doubt someone will email me later to point out what I missed here. Recorded in 2004 for the Criterion Collection, this commentary track features Anton Kaes from the University of California, author of the BFI classics book on M, and Eric Rentschler, Professor of German at Harvard University and author of The Ministry of Illusion: Nazi Cinema and its Afterlife. Now I'm not for a second questioning the considerable knowledge and insight of these two very learned gentlemen, but this is the sort of analytical commentary that never holds my interest for more than ten or fifteen minutes at a stretch. An academic exploration of the film's motifs, symbolism and underlying themes, many of the observations are interesting in themselves – the film is, after all, layered with subtextual meaning – but as presented here have the cumulative effect of stripping the film of its soul, not helped by the frequent pauses and scholastic delivery. There's also a nagging suspicion – common with this level of analysis – that meaning and significance are occasionally being found where none was consciously intended. Although usually reserved for films that have collectively been acknowledged as classics, deconstruction of this kind can be applied to just about any film you care to name – I could write you a long and meaningful sounding essay on the temporal and narrative symbolism of the pocket watch with a nail driven through it seen dangling in a tree in The Texas Chainsaw Massacre, but would I really be finding hidden meanings or simply projecting them? 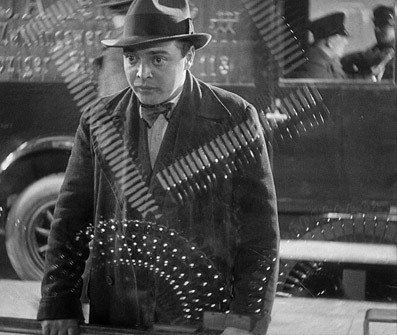 But as I said, there is still some good stuff here for the patient cineaste, not least the quote that reads uncannily like a description of Peter Lorre, and both men provide the odd bit of helpful historical and cultural background to the story and setting. A second commentary features Martin Koerber, supervisor of the 2001 restoration from which this edition has been sourced, plus filmmaker and writer Peter Bogdanovich, and Torsten Kaiser, who acts as host and provides background detail on the film and the contributors, plus extensive extracts from tapes recorded by Bogdanovich of his interviews with Lang for research on his book Lang in America. This is much more my sort of commentary, one whose analysis is focussed more on the characters, story, background and filmmaking, and where pauses are no longer than a few seconds. Koerber provides some really useful detail on the restoration process, including elements that have still not been recovered, Bogdanovich talks about Lang and references his interviews with him, and Kaiser fills in the gaps not covered by others. Best of all are the interviews with Lang, which despite the poor audio quality (they were only ever intended as research material and even restoration has left some of them hard to hear clearly) are an invaluable record of the director's recollections and are, like Bogdanovich's comments, generally paired with the scenes they discuss. Areas covered here include the decision not to show the child murders, the true-life case of child murderer Peter Kürten (regarded by many as the inspiration for the story), the documentary elements of lang's cinema, why M and While the City Sleeps are the favourites of his own films, the value of independence, his use of sound, the cuts made to Beyond a Reasonable Doubt, and plenty more. M in English? Surely not? I, for one, was not even aware such a beast existed, but in the early days of sound cinema the practice of simultaneously producing alternative versions of films for foreign markets was fairly common, and on very rare occasions – the Spanish language edition of Universal's Dracula is the most famous example – actually outshone the more commonly seen version. 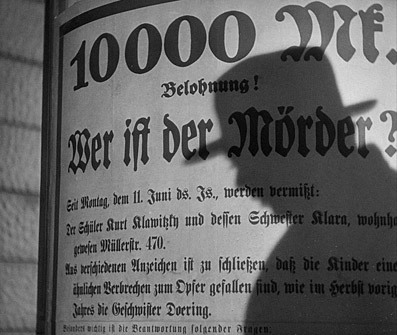 Unlike many of its counterparts, the alternative French and English language versions of M were not shot by Lang alongside the German version, but prepared after the director had completed the film and probably without his involvement. The English language version prepared for the UK market employs an intriguing blend of techniques, consisting mostly of Lang's footage and editing with speaking parts dubbed into English and newly filmed inserts used to translate the textual elements such as signs, posters, newspaper articles and letters. But some other scenes, ones where dialogue is crucial and faces are clearly shown, have been re-shot for this version. The early telephone conversation between the police commissioner and the minister has been re-filmed with English-speaking actors and sticks out like a hammered thumb, being laboured, stiffly performed and visually inconsistent with the surrounding scenes. 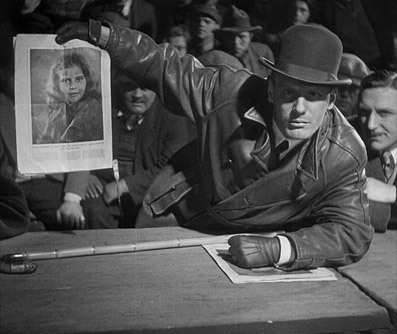 The real surprise, however, comes with Lorre's climactic speech to the criminal court, in which he and Rudolf Blümner perform their dialogue in English – I have a feeling that Blümner's voice was subsequently re-dubbed by an English actor, but Lorre's voice is his own, making this his first ever film performance in the English language. It is with some delight that I can report that he is is every bit as passionate in this foreign tongue as he is in his native German. This version is notably shorter than the restored German original and is also, as an only recently discovered and un-restored print, in far worse condition, but its historical and curiosity value is considerable. Somewhat astonishingly, the dubbing here is a far better matched to the performances than just about any example you'll find nowadays. An invaluable and fascinating interview with Lang, conducted in 1968 by a pipe-smoking Erwin Leiser, in which the director explains how he got into filmmaking and talks about M, the Mabuse films, the meeting with Goebbels that prompted him to flee Germany, and the greater freedom you had as a filmmaker back when everything was new and you are allowed to try anything on the chance it might work. Another lovely MoC booklet containing a short essay by Lang on M from 1931, an interview with him about the film conducted by Gero Gandert in 1963, details of the missing scene by Anton Kaes, a detailed piece on the multi-language versions of the film by Robert Fischer, publicity material, production design artwork, film credits, restoration details and stills. The decision to split the review between two of us was, I'll admit, initially prompted by workload, but was an easy one to make because of our unified love of this extraordinary film. Eureka may be kicking themselves just a little for labelling the previous release as the 'Ultimate Edition', but it doesn't matter. Even if you have that DVD (and you should) then this new release under the Masters of Cinema banner is still a must-have, the most complete version of the film available looking even better than it ever has on home video, particularly in its Blu-ray incarnation, and with the added bonus of the recently discovered English language version, an archive interview with Lang, a detailed booklet and two new commentary tracks. Highly recommended.